In 1874, with the help of the Oratorian Priests and the Archbishop of Westminster the Sisters of the Blessed Sacrament established their first house in England, a school for girls and a hostel, in Golden Square, London. This was followed by another in Brompton Square in 1880, and then Leicester Place, 1889 where they undertook to run the Girl’s School of Notre Dame de France which served the French Mission in London, under the direction of the Marist Fathers. Another convent was opened in Gloucester Gardens in 1915 to facilitate the rapidly expanding apostolate of Brompton Square. In the South of England a day school and a retirement home for Lady Boarders was opened in Brighton, Sussex 1886 and another in Beeding, Bramber, in 1903. 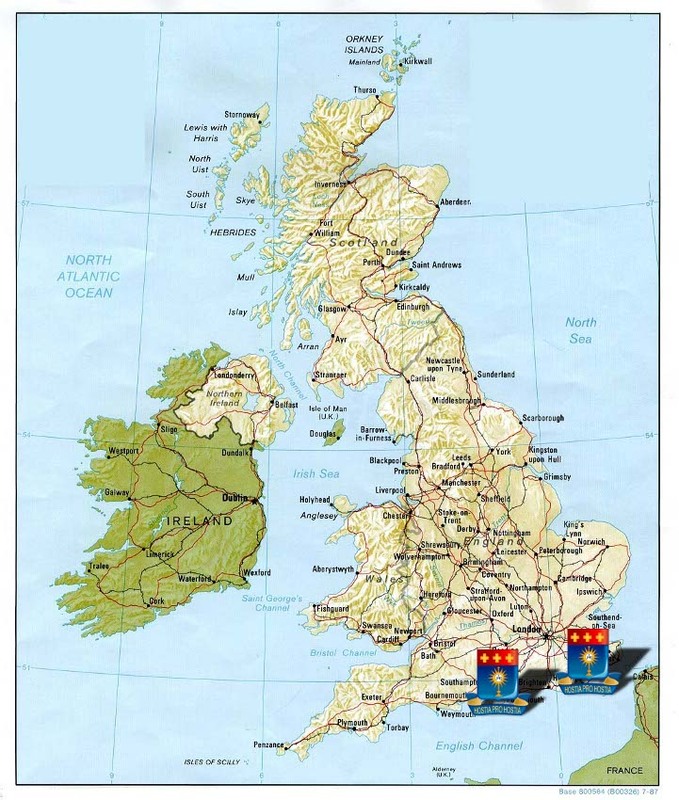 Today, the members of the two Foundations both situated in Sussex, -Beeding and Henfield- are still involved in Christian education and in parish ministry, with special sensitivity to spiritual ecumenism and dialogue. Blessed Sacrament Sisters arrived in Tullamore (Co. Offaly) in 1954 and set up the Marian Hostel. The hostel provides affordable accommodation for working and disadvantaged women in the midlands. Over the years the hostel has seen many changes influenced by the society and the evolving needs of modern Ireland. The people who have stayed in the Marian Hostel have had a positive experience and have felt supported in their journey through life. 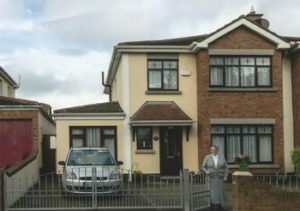 In 1990 a new parish began in Seabury (a residential area 15 kms north of Dublin).Two years later the Congregation of the Blessed Sacrament sent a community of sisters to share in Yellow Walls Parish life in Malahide (Co of Dublin). The sisters were engaged in parish ministry in local parish and also worked in neighbouring schools and with people with special needs. Linked to each blazon, you will discover the origins and current role of sacramentine community in this location, as well as links to friends who share their missionary activity and evangelization. The houses between the Motor Works garage and J.J. Horan’s shop are all late 18th century and early 19th century in date. Part of what is now the Marian hostel was once a boarding school. It has also the distinction of being the first house in Tullamore to install piped water when it became available in 1895. 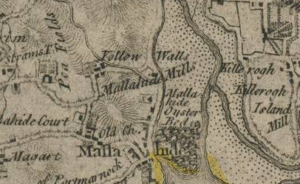 Prior to that time, householders had to depend on wells which it was alleged were contaminated with seeping sewage. The sisters have always endeavoured to meet the person’s accomodation needs with a sincere and open approach. They accept each person at face value respecting their dignity and privacy. Each person has the freedom to avail of hostel accomodation for their chosen period of time. The sisters maintain a low profile in supporting each person.when deemed necessary they liaise with statutory and other voluntary agencies for the benefit of the person. Today the hostel has the capacity to provide bed and breakfast accommodation for 17 women in self contained flats and single rooms with ancillary dining rooms, kitchenettes, sitting rooms, reception rooms and washing facilities. There is also an oratory/prayer room wich provides a quiet space for reflection. Over the years, people have stayed in the hostel for a variety of personal reasons.We had women who stayed to avail of work, for others, it was to get away from family problems for a short period, others still found themselves out of home with no where to go. Students and occasional tourists have also availed of our services. Sr Margaret arrived in Seabury in1991 and the other sisters in 1992 The Sisters of the Blessed Sacrament live within the Parish of Yellow Walls in Seabury. The Sisters participate in the life and work of the Parish, Children’s liturgy, Family Mass, Adult liturgy and Readers Rota, taking Holy Communion to the sick and housebound, and the Prayer life of the Parish. They also work in education; home care support and they pay visits to families of the Parish. During our time here in Yellow Walls Parish, we have marked a number of mile stones – Sr. Frances celebrated her Religious profession and the life of the community opened more to the people of the parish. When the Parish Pastoral Council was established the sisters were chosen by the parish as representatives on the council. 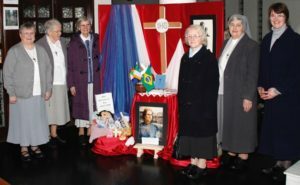 Sisters of the Blessed Sacrament were also greatly involved with the Beatification of their Founder, Blessed Peter Vigne during our time in Malahide. The organisation and preparation for these events was done with the generous assistance of Parishioners of Yellow Walls. Sr.Margaret who was sacristan at our parish Church (Church of the Sacred Heart) celebrated her silver jubilee whilst at Yellow Walls also. To really feel the emotional intensity of that epic missionary venture in Brazil, one should read the two volumes of “Pages Intimes”, a collection of letters and annals that chronicle the story of the various foundations. These were often difficult and hazardous experiences for the Sisters arriving from Europe, on their first contact with tropical diseases and infections endemic in the Region. Great selflessness and fervour quickly ensured the replacement of European sisters by their Brazilian counterparts. The region grew rapidly. Between 1920 and 1927 in Salvador, there were 40 clothing ceremonies, 30 temporary professions and 16 final professions. 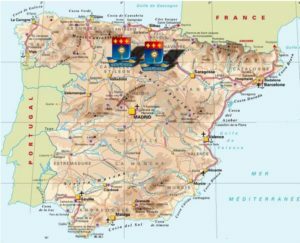 It was not until November 1964 that “the doors of Spain” finally opened to the first Sacramentine Community which established a mission in SASAMON, the diocese of Burgos. In this village, located in the province of Castile and Leon,the Community dedicated themselves to education, teaching, catechesis and pastoral ministry. In August 1974 the second Community was founded in the town of Burgos: “EL FARO”. The focus of this Community was hospitality and the provision of Formation for those who wished to respond to the Lord’s invitation to serve him as Sisters of the Blessed Sacrament. At the same time the Sisters devoted themselves to the apostolate of education and catechesis for children and young people. in relation to Sasamon the emphasis is more on hospitality towards pilgrims, and pastoral work. Burgos continues its mission of education of young children and of attention to the parents and their needs; as well as its work towards Sacramentine Formation. Every day the Eucharist is the strength and centre of their lives as they seek to express in a concrete way the spirit and missionary drive of the Founder, Blessed Peter Vigne. T he French origins of the Religious of the Blessed Sacrament go back to 1715 and are part of a Vivarais deeply divided between a Protestantism for which there is growing intolerance since the Revocation of the Edict of Nantes, and a Catholicism, carried along on the tide of the Counter-Reformation. The seven “first Sisters”, founders of the Institute are followed by many others. At the death of Peter Vigne (1740) they number one hundred caring for 19 establishments. In 1787, when the Royal Patent Letters finally conferred on the Congregation a legal civil existence, 39 groups were established in a small section of the South-East of France (Ardèche, Drôme, Lozère, Isėre, Vaucluse, Gard, Bouches-du Rhône). A new cyclone strikes in 1901 when, due to the enforcement of the laws separating Church and State the Sisters are expelled from 56 schools and hospitals. After the confiscation of Romans, there was a new exodus in the direction of Valence (1906) where many sisters were welcomed, who, on refusing to be secularised were deprived of the possibility of assuring any mission. 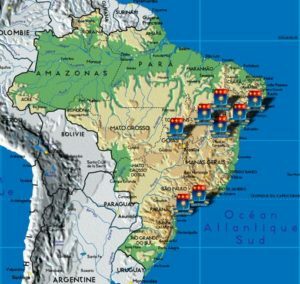 Switzerland, Monaco and Belgium were merely embryonic responses to the powerful missionary thrust and energy that sprang up…….The epic exodus to Brazil can now begin! 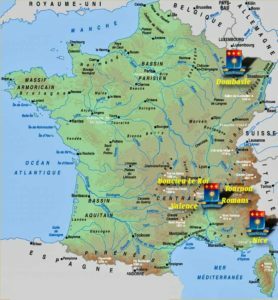 Today, the eight French communities have regained their initial Rhodanien roots (Rhône valley) enlarged by the two communities, Nice and Dombasle (Meurthe et Moselle), where they exercise their mission in education and care, in accord with current human resources, the missionary needs of the Dioceses, and in keeping with the health care and social policies of the French State. The journey to Rome undertaken by the Superior General, Mother St. Joseph Bouvaret in 1869 was primarily to obtain the approbation of the Institute as quickly as possible. However, Pope Pius IX recognising her extraordinary missionary zeal and vitality helped to facilitate the immediate establishment of the first foundation in Italy, at Subiaco, in a house that was at one time the holiday home of Pope Pius IX and of Pope Pius VI who died in Valence in 1799! Today, the seven Italian communities take great pride in continuing to cultivate the spiritual heritage of Peter Vigne in primary schools (in Lanuvio, Carpineto, Frascati), a college (in Frascati), retirement homes (in Carpineto) a place of welcome at the shrine (in Bolsena) and in outreach ministries in the working-class districts of Rome (Mater Ecclesia). The prospect of opening a house in Africa underwent a prolonged period of gestation, from the time it was first proposed to its inauguration…..four decades! From as early as 1964, carried along on the post-conciliar tidal wave of enthusiasm and zeal, hopes were high that we would shortly be starting a mission in Africa, but, that was not to be until 2004. For several years young women from the Democratic Republic of Congo, Tanzania, Angola, Uganda, and the Cameroon who wished to become Sisters of the Blessed Sacrament were received in Europe. 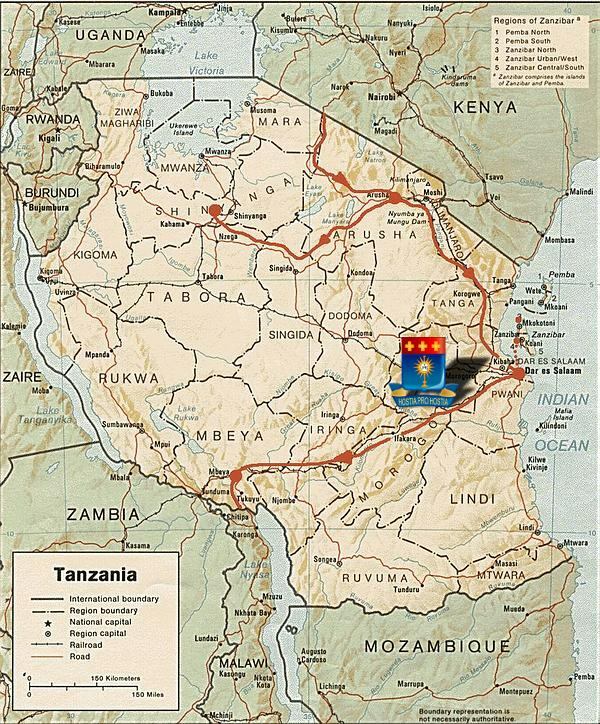 Latterly, beca use of its long Christian tradition and love of peace, Tanzania was chosen as the country where all future vocations to the Congregation would be received and accompanied. The community at Morogoro is situated in the little village of Kilakala, in the shadow of the Uluguru Mountains. Its location reflects that of Boucieu, the cradle of the Congregation, nestling among the mountains of the Ardèche. The foundation started in 2004 with five sisters from different countries (Brazil, Italy and Tanzania). Faithful to the spirit of Peter Vigne and his evangelical intentions, the Sisters are involved in the education of children from 4 to 6 years of age, in parish ministry and in the preparation of young women for religious life.